I saw a blurb on Twitter awhile back about hand feeding chickadees at the Brecksville Nature Center and ever since then, I'd been dying to try it out. My friend Christine is an avid bird watcher and told me that it was a really cool experience and that I needed to try it out. My fiance and I attempted to go near the holidays, but we were pretty busy and when we finally did have a chance to go, the weather was too bad and we decided that driving in a snowstorm just to feed birds wasn't a good idea. Last Saturday we made the trek out to Brecksville even though it was super cold. On the drive to Brecksville, my fiance asked me how this all worked. I explained that the birds fly up to you and eat seeds from your hand. Being from Florida, he didn't know what a chickadee is, so in his mind, he thought we were going to something similar to a petting zoo and we'd be hand feeding small baby chicks. Oops. No wonder why he didn't seem all that excited about feeding chickadees! When we got to the nature center, there was a nice man next to a huge container of sunflower seeds who explained the process to us. Basically, you take a handful of seeds, place them in your palm, stand in a specific area, stay still and quiet, and hope for the best. We positioned ourselves away from the other people attempting to feed birds and were underneath a tall pine tree. My fiance was closer to the tree and the birds were more interested in him at first. It was kind of neat. The little birds would fly nearby to scope us out. Once they determined that we weren't huge cats who were about to eat them, they'd gently land on your hand, make eye contact, and then take a seed and fly off to eat it. I really can't put into words how neat it is to have this tiny wild creature land on you and trust you enough to take food from your hand. I felt like I was Cinderella and all of the wild creatures were my friends for a brief minute. I even had a bird land on my head. That was interesting. Had it not been so cold I could have stood out there for hours. I grew up on a big piece of land and spent lots of time outside. Mainly reading books, but...I was still outside. I was an only child and we didn't have neighbors, so I spent a lot of time using my imagination and I always wished the animals in our yard would want to play with me like in cartoons. I had bunnies and squirrels and raccoons get close. (I did get to feed raccoons and squirrels by hand) But...I was never able to make friends with the birds. Feeding chickadees this past weekend brought one of little Roxanne's dreams to life and was really one of the coolest experiences I've ever had. Hands down. 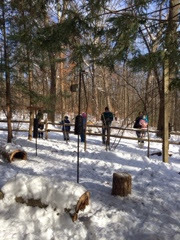 Chickadee feeding takes place every weekend (Saturday and Sunday) from 10 am until 12 pm at the Brecksville Nature Center from now until late February. Weather permitting, obviously. This is a really fun (and free!) activity to try out and would be great for kids, too. No matter where you live in Cleveland, this is 100% worth the drive. Just be sure to bundle up and bring your patience with you and you'll have an experience of a lifetime! Whenever Matt and I do this, the birds are always way more interested in him. I think it's because he is taller and more tree like.